I often notice themes running through my life and lately it has been the theme of perfection and my discomfort with being imperfect. At the end of December, I moved in to a new office and between the holidays and the move, I feel like I can’t catch up at home or the office. Sound familiar? Maybe you set a New Year’s resolution and feel like you are failing just over 3 weeks into January or maybe you feel pressure to be the perfect student, daughter, employee, wife, mother . . . (feel free to fill in the blank here). Many of the clients I work with strive for perfection and underlying this drive is the fear of failure. In graduate school, they tell you that you will get the clients you need – meaning the clients that lead you to reflect on your own challenges, struggles, insecurities, etc. – and this couldn’t be more true of my experience. Every day, I sit across from people struggling with problems such as eating disorders, depression, and anxiety and often there is a common theme in our lives – the pursuit of perfection. So, what does this pursuit of perfection cost us? Lately, the costs for me have been steep and include feeling inadequate, feeling stressed out, worrying, loss of sleep, time spent obsessing over things that need to get done, loss of connection with things that are important to me like my family and my ability to be fully present . . . And to what end? The truth is that I am not perfect – I am human – and it is okay. In fact, it takes courage to be imperfect. With this realization, am I willing to do what I ask my clients to do? Am I willing to be imperfect? To accept my humanity? The answer is yes. In fact, as I sit and write this blog post I have a long “To Do” list sitting beside me. I’ve been tackling this To Do list for weeks in lieu of writing a blog post (and many other things that I deemed “less important”), yet I find that the list grows every day. Part of my willingness to be imperfect requires accepting that there will always be something “To Do” (or many somethings) AND if I am going to live a life of vitality and meaning; I have to have the courage to let go of perfectionism and be imperfect. This may mean setting aside my To Do list from time to time and making space for the anxiety that may come up for me as a result. This past weekend, I did exactly that. I set aside my To Do list and I went out of town. I spent time with family and friends, went snowshoeing, and relaxed. And when I returned, my To Do list was still there and nothing catastrophic happened because I set it aside for a few days. In fact, the opposite happened. I felt re-energized and more prepared to return to work, including my To Do list. I am daring to be imperfect and make space for my mistakes, flaws, and limits. This is why it takes courage to be imperfect because accepting that you are imperfect means you stop avoiding and trying to control the thoughts and feelings that imperfection brings up for you. If you struggle with perfectionism, what does it cost you in terms of time, energy, health, money, and well-being? Is it helpful in moving you towards your values – towards what’s important to you in life? 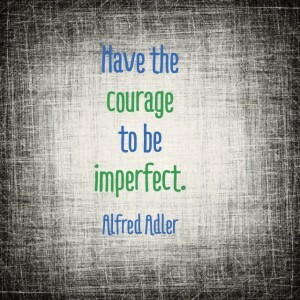 How would your life change if you had the courage to be imperfect? Are you struggling with perfectionism and looking for support? To schedule an appointment, contact me at catherine@embracestrengthcounseling or visit my website for more information about my services. Good for you Catherine! Thanks for sharing your journey, which I think every one of us can relate to! Kudos! Great post, Catherine! I think we all fall into the perfectionism trap sometimes. Great reminder that we need to re-evaluate our thinking and embrace the imperfect!